1kg (1000 gram) gold bars are the ideal choice for investors wishing to convert larger amounts of capital into gold bullion. Although unique products like our 400oz bar are available, 1 kilo is the standard ‘large’ bar size that is favoured by discerning bullion buyers around the globe. Gold has long been the ‘go-to’ precious metal for serious investors; it retains its value in turbulent times, it’s relatively scarce and always in demand. Each of our exceptional cast bars contains exactly 1000 grams of 99.99% (24 carat) gold. 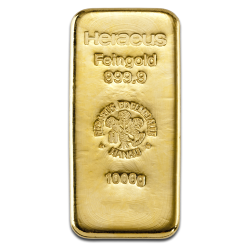 We only stock 1kg gold bars manufactured by LBMA approved refiners like Heraeus and all our investment bars are VAT Free to buyers within the EU. Shop for 1kg cast gold bars today at low premiums and enjoy outstanding service and secure delivery with coininvest.com.